Note: I will update this post progressively with photos and network architecture I have in mind. Clearly the title of this post is directed at the recent surge of mentions on BYOD (Bring Your Own Device). BYOD is progressively adopted by many organizations as this brings down capital and operating expenditure. But I'm not going to discuss this in the post. While waiting for the launch of Windows Server 2012, I've decided to build a new PC as a lab machine. 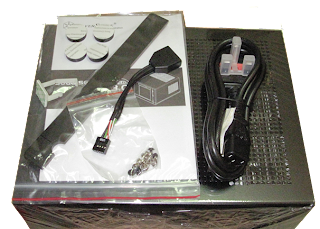 The following is a list of items that I've purchased to build this miniature and wonderful lab machine. I would read the title as Build Your Own Lab or Bring Your Own Lab. The latter is a concept of bringing a lab machine to work which is built and own by the IT Professional. It gives employers the impression of you wanting to upgrade or maintain your skills proactively. Of course this is hard to be adopted, since most of us will be thinking - "shouldn't the employer provide this". I always wanted a machine that has a small footprint, in terms of physical size and low electricity consumption. This will be in line with the efforts that Apple has done on Mac Mini. While being small, it should also be able to handle workloads that I'm going to stress on it. For example, running close to 7 to 8 virtual machines which will contain domain controllers, SQL clusters, Exchange clusters, Citrix Farm, Sharepot Farm, System Center suites and probably surrounding system packages for Anti-virus and Backup. On another aspect, I would also like the machine to be able to handle gaming, which is why the sizing has to take care of future upgrades and support of current games. While the support will not be spectacular at first, it should still minimally support popular games like Diablo 3. Small footprint. Light to carry and easy to store. Ability to upgrade when required. Ability to handle large workloads as a lab machine. The parts for the build, excluding HDD. 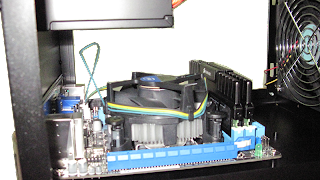 I've selected the SG05 as it is one of the smallest around that is able to fit the components I'm fitting it with and has ample space for a decent graphics card in future. 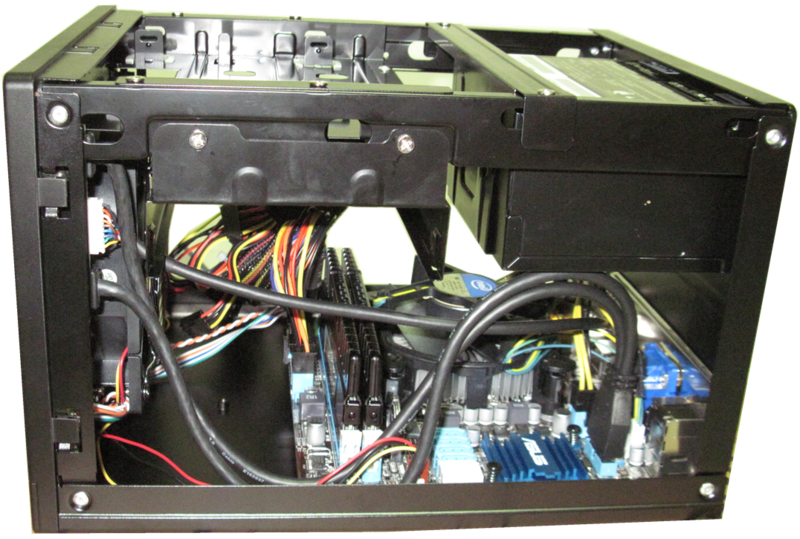 The bundled PSU is 450W providing enough power too for future expansions. 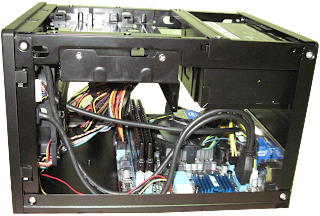 I've considered other casings like Lian Li PC-Q08 (link) which is taller and can hold about 6 3.5" drives, and Thermaltake Armor A30 (link) which is longer and does provide more internal space. However, I have intentions to purchase a NAS thus I've decided to favour SG05. 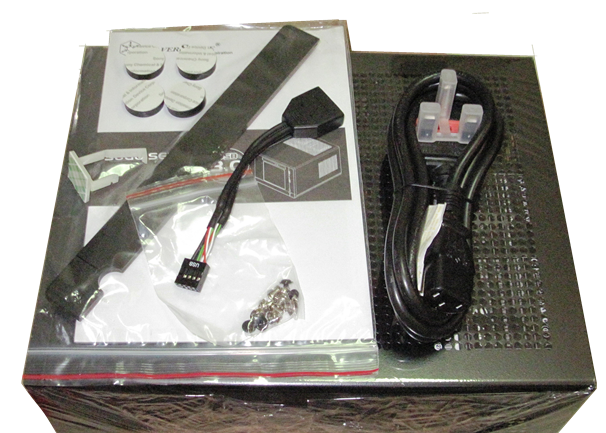 The Silverstone SG05 casing with accessories included. 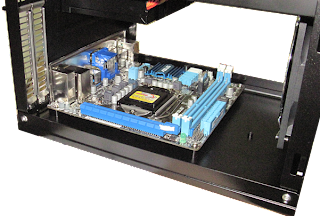 There were few mini-ITX motherboards that were shortlisted during the research; ASUS P8H77-I, ASUS P8Z77-I DELUXE and ZOTAC Z77-ITX WIFI. Initially, the research went into comparison of chipsets. The major difference between H77 vs Z77 is CPU Overclocking. In my opinion, overclocking is not necessary and I do not run into thermal issues as the casing's internal is already tight. Therefore H77 is selected. The other area is what each motherboard offers. I personally liked Zotac's package which seems to be the only motherboard with 2 x Gb onboard ethernet ports. This would be useful when testing Windows' NIC Teaming or using 1 port for network and the other to an iSCSI storage. However, I do not need the chipset features and wireless functions. 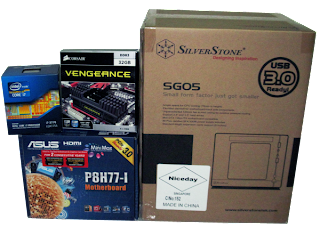 Finally, based on the chipset selection and needs, the ASUS P8H77-I is selected. In terms of CPU, I was hoping to purchase the Intel i7-3770T (link) because of maximum TDP 45W compared to Intel i7-3770 maximum TDP 77W. Both CPU supports VT-D that is not found in i7-3770K (link) which is crucial since I'm going to run loads of virtualization workload. In the end, due to the lack of stock, I've purchased i7-3770 for a price that is very near i7-3770T. You might be wondering why I purchased a 4 DIMM package while the motherboard can only hold 2. I have purchased this with a friend whom is sharing the same specifications as me. Although this ram is DDR3 1600Mhz and is certified by ASUS, it drops to DDR3 1333Mhz. I'm still yet to check if it's something that can be resolved thru a update. Ample clearance for both ram and cpu. The Momentus XT is an old hard drive which I'll be using it to host the operating system. 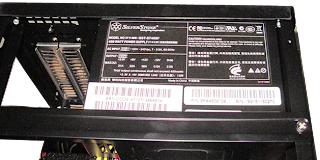 This is a hard drive with with 4GB SSD (SLC) integrated and with algorithms developed to optimize performance. WD RED is developed and targeted more towards NAS and I've selected this as I will be moving it to a NAS in future. The final product before inserting HDD. I've created an Amazon list so you can easy view and purchase them online. For updates, follow this post.